The Time Swing Projection tool was designed by the Sacred Science Institute: please contact them to enable the tool on your account.The tool allows you to select a specific date on a chart, and set two planets (Mercury and Mars by default), and measure the difference between the two in degrees. For example on the 3rd of August 2015 Mercury and Mars were 24.34 degrees apart on a Geocentric Ephemeris. The indicator then searches forward from the selected date and marks any point where this same degree of separation occurs. Additional levels can also be added, for example, a level of 30 degrees, would add a marker for any date where a separation of 54.34 degrees occurs (24.34 + 30). Once the tools have been enabled on your account, the Time Swing Projection tool will be available in the Astro tools folder. Left-click where you want the tool to begin, and the TSP will display on the chart. 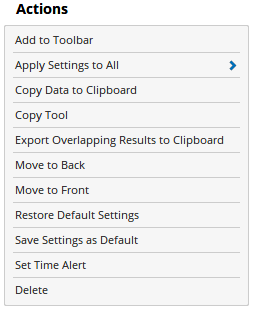 Add to Toolbar: Click this action to add the selected custom Time Swing Projection to your custom toolbar. Apply Setting to All: When multiple Time Swing Projection Tools have been applied to a chart, page or workbook, this action can be used to apply the settings of the one selected to other instances of the tool. This is a great time saver if an adjustment is made o the tool - such as hiding or adding levels - as this allows all the other Time Swing Projection tools in the chart, page or entire workbook to be updated instantly. Copy Data to Clipboard: Will copy the tool's values to the clipboard, which can then be inserted into a spreadsheet, for example, allowing for further analysis. Copy Tool: Allows you to copy the selected Time Swing Projection tool, which can then be pasted onto a different chart window. Export Overlapping Results to Clipboard: If multiple planetary pairs have been setup in the Time Swing Projection tool, it is possible for overlaps to occur. For example, in a day there could be three progressions: Mars-Sun at 42 degrees offset, Mars-Jupiter at 15 degrees offset and Mars-Uranus at 123 degrees offset. This action allows you to find these overlaps, and export them to the clipboard where they can be pasted as a table into Excel or Notepad. Move to Back: If the symbols of the tool are displaying in front of other tools or indicators, clicking this action will move the symbols view to the background. Move to Front: If the symbols of the tool are displaying behind other tools or indicators, clicking this action will move the symbols view to the forefront. Restore Default Settings: Click this action if you have adjusted the default settings of the Time Swing Projection tool and wish to return to the standard properties originally installed with Optuma. Save Settings as Default: If you have adjusted any of the Time Swing Projection Properties (colour, for example) you can save the adjustments as your new default setting. 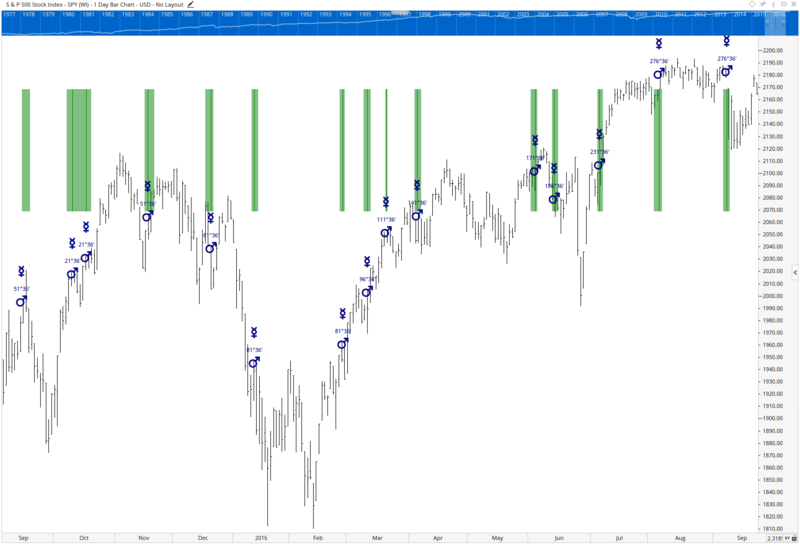 Each time you apply a new Time Swing Projection to a chart, the tool will display using the new settings. Delete: Delete the Time Swing Projection tool from the chart. Pair of Planets: Allows you to adjust the colour of the Line and Orb for each pair of planets applied to the chart. For example, if you are displaying Mercury, Mars and Saturn, then you can make the Mercury-Mars line and orb green, Mercury-Saturn blue and Mars-Saturn red. Additional Levels: Allows you to select the levels you want to appear on the chart. You can also add new levels here. Planets: Allows you to set which planet / planetary bodies are used in the calculation of the tool. Include Retrograde: When selected, this property includes retrograde orbs. Show Overlaps: When selected, the orbs will separate and show the individual orbs. When deselected, the orbs will overlap. Direction: Allows you to adjust if the tool projects Forward or in Reverse. Start Date: Allows you to adjust the start date of the Time Swing Projection. Geo / Helio / Sidereal: This setting allows you to change the Time Swing Projection setting between GeoCentric, HelioCentric and Sidereal. GMT Offset: Allows you to adjust the Time Swing Projection time zone setting for a specific market. Select the required GMT setting and the Time Swing Projection tool will automatically update. Show Lines: When deselected, the vertical lines will not be displayed. Line Style: If Show Lines is enabled, this property allows you to adjust the type of line displayed. There are 8 options available: Solid, Dots, Dash, Dash Dots, Long Dash, Long Dash Dot, Long Dash Dot Dot, Stippled. Show Date: When selected, the date label for each orb will be displayed. Show Symbol: When selected, the symbol for each orb will be displayed. Show Values: When selected, the values for each orb will be displayed. Label Size: Allows you to adjust the size of the label text. Moving the slider bar to the right increases the text size. Orb: Allows you to adjust the acceptable variance for the Time Swing Projection. Full-Size Height: When selected, the Orb will extend the full length of the chart, but not across indicators that are displayed in a separate view, e.g. volume. Orb Over All Views: When selected, the Orb will extend the full length of the chart and will also extend to tools that are displayed in separate views, e.g. volume. Show Symbols: When selected, the Time Swing Projection symbols will be displayed on the chart. Position: Use this option to adjust the position of the Time Swing Projection symbols. The following positions can be selected: High, Low, Top, Bottom, Floating. Symbol Size: Allows you to adjust the size of the Time Swing Projection symbols. Moving the slider bar to the right increases the Symbol size. Symbol Colour: Allows you to adjust the colour of the Time Swing Projection symbols. Stack Symbols: When multiple Time Swing Projection symbols are added to a chart, this property allows you to stack them instead of having them appear in front of each other.